Mazuri’s Mini Pig Elder is a low-energy, high-fiber diet that was specially formulated to meet the needs of exotic miniature pigs, such as the Vietnamese potbellied pig. This formulation is designed to restrain growth rate while helping to satisfy hunger. This ration can be used as a maintenance diet for adult animals that are not reproducing or lactating. 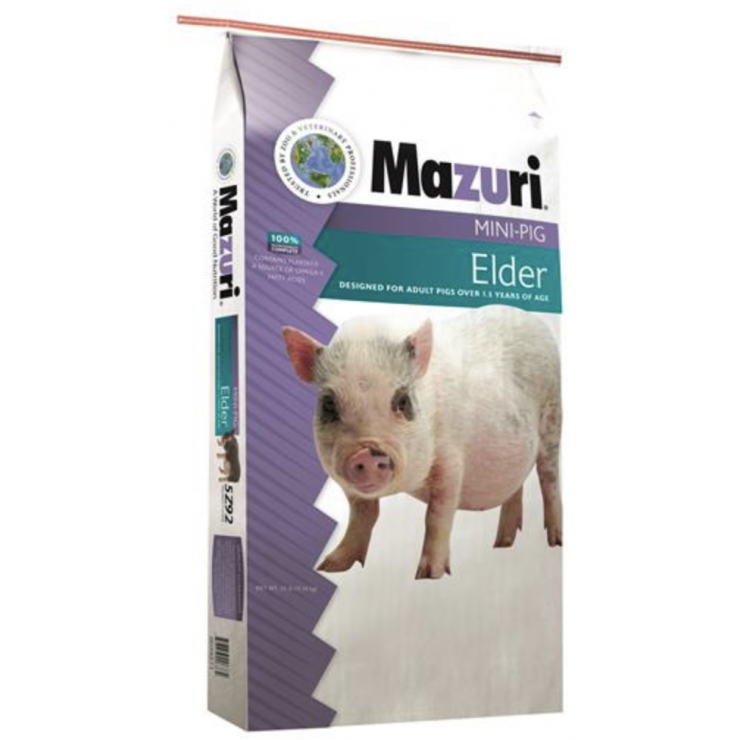 Feed Mazuri® Mini Pig Elder to pigs previously fed Mazuri® Mini Pig Active Adult or to less active senior or overweight mini pigs. Mix this product with equal amounts of prior product for at least 3-5 days to help adjust animals to new feed. The level of feed intake depends on many factors some of which include: environmental temperature, other foods available, level of activity and social hierarchy. For maintenance of adult animals (1 ½ years of age or older), regulate feed to a level which maintains body weight without putting on excess fat. A level of 1.0 – 2.0% current body weight works well for many owners. Active animals may require more feed. Measuring of food by weight is recommended; see Feeding Rate table on the product sheet using the Complete Nutrition Information link above. When using a self-feeder, make sure it is adjusted for minimize feed wastage. Always provide animal with plenty of fresh clean water. Feeding rates available on the product sheet. Ground corn, ground oats, wheat middlings, ground soybean hulls, dehydrated alfalfa meal, flaxseed, dicalcium phosphate, cane molasses, calcium carbonate, dried beet pulp, calcium lignin sulfonate (pellet binder), l-lysine, ammonium chloride, salt, choline chloride, zinc methionine complex, dried yucca shidigera extract, pyridoxine hydrochloride, biotin, calcium pantothenate, d-alpha-tocopheryl acetate (form of vitamin E), ferrous sulfate, cholecalciferol (vitamin D3), vitamin B12 supplement, folic acid, menadione sodium bisulfite complex (source of vitamin K), vitamin A acetate, riboflavin, l-tryptophan, niacin, thiamin mononitrate, artificial flavors, citric acid, monosodium glutamate (flavor enhancer), dl-methionine, manganese sulfate, manganous oxide, preserved with mixed tocopherols (form of vitamin E), copper sulfate, BHT (a preservative), propylene glycol, ascorbic acid, rosemary extract, zinc sulfate, lecithin, ethylenediamine dihydriodide, copper chloride, sodium selenite. For maintenance of adult animals (1 ½ years of age or older), regulate feed to a level which maintains body weight without putting on excess fat. A level of 1.0 - 2.0% current body weight works well for many owners. Active animals may require more feed. Measuring of food by weight is recommended; see Feeding Rate table on the product sheet using the Complete Nutrition Information link above. Feeding rates available on the product sheet. Storage Conditions For best results, store contents of open bag in container with sealing lids. Store in a cool (75°F or colder), dry (approximately 50% RH) location. Use within 1 year of bag manufacturing.